What is more comforting than a meat sauce that’s been simmered for hours on the stovetop? This Braised Beef Ragú recipe is sure to impress – not only for how simple it is, but for how delicious it is! Winter in New England is no joke. It’s cold, it’s windy, it hurts your face. 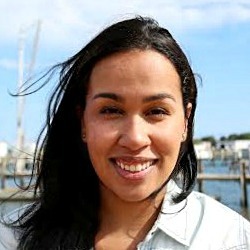 As a Caribbean born and raised chef, winter in New England challenges me a lot – mentally and physically. Granted, it also makes me appreciate the other season so much more, so today we’re embracing winter wherever you are and cooking up a meal that will warm you up from the inside out: Braised Beef Ragú! 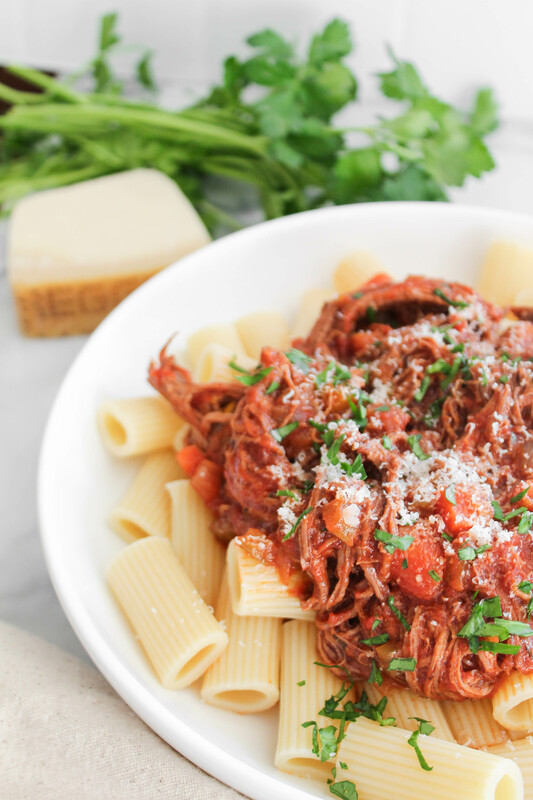 Simply put, this Braised Beef Ragú is a recipe that will simmer for hours on your stovetop, ultimately resulting in a luscious, stick to your bones sauce that you can serve over rigatoni or any pasta of your choice. It’s also amazing over rice, mashed potatoes, or even zucchini noodles. The herbs and vegetables in the sauce simmer together to form such a rich sauce, that you’ll just need a light sprinkling of parmesan cheese to make this recipe shine as bright as possible. You might be wondering, what’s the difference between a ragú and a bolognese sauce? Traditionally, it’s the type of meat used. For a ragú, you’re using a cheaper cut of beef that can be simmered for hours and eventually be super tender. For a bolognese, you’re using a variety of ground meats (typically pork, veal, and beef, although some recipes call for sausage), and can whip one up in under an hour if need be because the meat doesn’t need to tenderize. There’s a place and time for each of them, because they are both fabulous, but when your home is cold and needs to warm up simmer a ragú for 4-5 hours on the stovetop and tuck into a bowl of it while cuddled on the couch! Need a couple more hearty pasta recipes? Try the following: Creamy Butternut Squash & Bacon Pasta, One-Pot Chicken and Vegetable Pasta, and Butternut Squash Macaroni & Cheese. 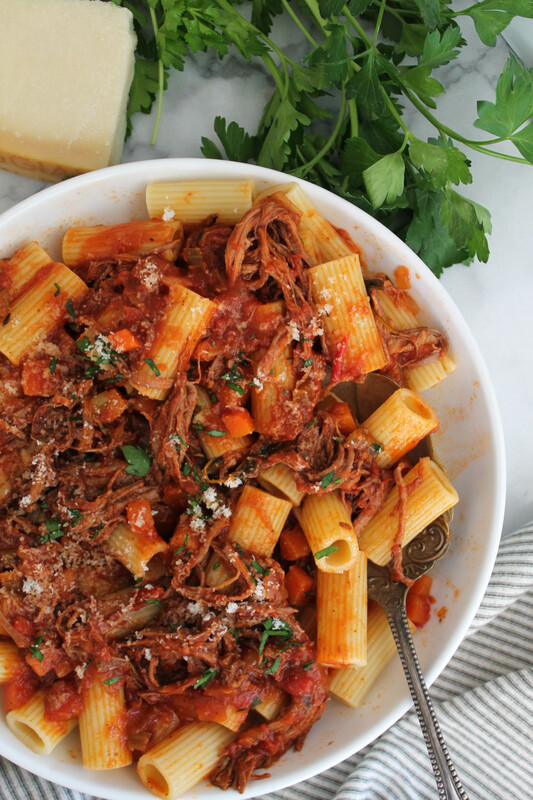 This Braised Beef Ragú is easy to prepare and will make your home smell amazing as it cooks! In a stock pot, heat the olive oil to medium high heat and sauce the onion, carrots, and celery for ten minutes until fragrant. Add the garlic and cook for 5 more minutes, reducing the heat to medium. Deglaze the pan with the wine, scraping the glazed bits on the bottom. Add the crushed tomatoes, tomato paste, balsamic vinegar, and carefully place the chuck inside the pan, covering with stock. Throw in the herbs, lower heat to the lowest setting possible, cover with lid and cook for 3 hours undisturbed. Remove lid and if meat is tender enough, use two forks to shred the meat. Cook for another hour on low, covered. If meat is not tender enough, cover once again and cook for 30 more minutes until you can shred. Once cooked all the way through, season with salt and pepper, and serve over pasta, topping with a sprinkling of parmesan cheese and fresh parsley or basil.